Maj. Jessica Martz has had quite a year serving as a military attorney. 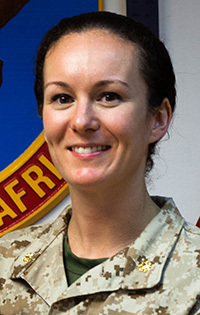 First, the 2011 University of Wyoming College of Law graduate, who has family in the area and is originally from Oakland, Calif., and another UW law graduate and a UW College of Law professor, defended a female Marine Corps drill instructor on multiple charges that could have derailed the defendant’s military career. Following a grueling two-week trial, the sergeant was acquitted. Then, Martz received the Federal Bar Association’s Younger Lawyer Award. UW College of Law Professor Steve Easton, who nominated Martz for the award, says that it is “rather unusual, though not completely unheard of,” for a military lawyer to receive the Younger Lawyer recognition. The Federal Bar Association membership consists almost entirely of civilian lawyers -- like those who work for the Department of Justice and other federal agencies, and those from private practice who litigate in civilian federal courts, Easton says. Martz, who graduated from the U.S. Naval Academy in Annapolis, Md., with a B.S. degree (2003) in English and an M.A. 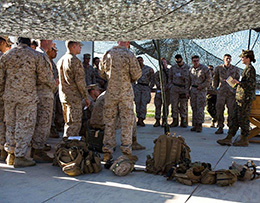 degree (2007) in American history from American Public University, is a staff judge advocate of the Special Purpose Marine Air Ground Task Force-Africa in Spain. As a deployed attorney overseas, she advises the commanders and staff of her unit on the rules of engagement, international and operational law, contract and fiscal law, administrative and civil law, and military justice. Martz’s national award was based largely -- but not exclusively -- on her work defending Sgt. Maria Vega (fictional name, to protect the actual defendant from publicity that some might consider negative, Easton says), a Marine Corps drill instructor who faced 28 counts in a South Carolina military courtroom last December. Most of the counts involved alleged assaults of recruits during boot camp and violations of the Marine Corps’ recruit training order, which is more than 100 pages long. Martz and another recent UW College of Law graduate, Capt. Hannah Stephens, from Loveland, Colo., were assigned to defend Vega. Because the case was so large, with more than 70 listed witnesses, they asked Easton to help with the case. Although it was widely assumed that Vega would be found guilty of multiple counts, her UW defense team was convinced of her innocence. “We faced an uphill battle, because a two-thirds vote of the jurors, called ‘members’ in military trials, is sufficient for conviction, unlike civilian trials that require a unanimous vote for conviction,” Easton says. After motions to dismiss some counts, 20 counts remained, but the members found Vega not guilty on all charges. Easton credits Martz’s UW College of Law training as the key to winning a favorable verdict in military court. He called Martz and Stephens “heroes” for winning the case. While she was a law student, Martz worked in UW’s Prosecution Assistance Clinic, one of six clinic programs that give all UW law students the opportunity to practice law before graduating. As a student in the clinic, Martz briefed and argued a case before the Wyoming Supreme Court. Martz says working in the Prosecution Assistance Clinic, and taking Easton’s trial practice course, prepared her for trial work. She also was raising a family at the time.